Mark Osterhaven at Worth Avenue Yachts tells me his listing for sale, the 36.58m motor yacht Banyan, closed yesterday with Michael Mahan representing the buyer in an in-house deal. Banyan was built by Italian superyacht yard Benetti in GRP to a design by Stefano Righini and, ABS classed, was launched in 2008 as one of the yard's Classic 120 models. MCA compliant, her interior by Francois Zuretti is warm, elegant and welcoming, accommodating 10 guests in five staterooms. A spacious master suite is on the main deck forward with a king-size bed, ample storage, a walk-in wardrobe and complete entertainment system. On the lower deck aft are four guest suites comprising two VIP staterooms with queen berths and two twin guest cabins, all with en suite bathroom facilities. In 2012, a thorough refit included painting the entire exterior, changing her black hull to light grey, as well as a complete interior refit. She also completed her Cayman Island Commercial certification. Twin 1,550hp Caterpillar engines give her a range of of 3,300 nautical miles and she is fitted with zero speed stabilisers. 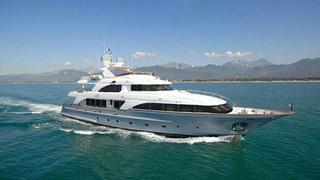 Always privately used and never chartered, Banyan was asking $8,950,000.